We have been coming to Camden Hills and the midcoast Maine area for years, and we love this park. We have camped, hiked, and mountain biked here many times. The camping area has different loops. Sites 1-50(ish) are more wooded, sites in the upper loop for the most part are more open and field-like. Some sites are reservable, some are first come first serve. Be aware of events in the area (lobster fest, etc) as well as holiday weekends - the park books up quickly in nice weather. The park itself has some great hiking/running trails, including Mount Battie (accessible by auto road also) and Mount Megunticook. Not huge peaks by any means, but the trails up (especially Megunticook) are challenging rocky/rooty New England trails. Both offer beautiful views over Camden Harbor and Megunticook Lake. Mount Battie also has a tower at the top which is fun to check out! The campground was very clean, and the staff very accommodating (on one of our stays we ended up in a more open site in hot summer weather. We were able to easily switch the next day when some campers moved out of the first come first serve sites in the more wooded loop. The area is beautiful and full of great things to do. Across the street from the camping area are some trails and and picnic areas along the ocean. Downtown Camden is a fun town with great restaurants, coffee shops, and a beautiful harbor with boat tours and kayak rentals. Head south to Rockland and Owls Head for the transportation museum, or head north to Belfast (don't miss Marshall Wharf Brewing). There is some amazing mountain biking at the nearby Camden Snow Bowl and adjacent Ragged Mountain Preserve. As a Ranger for the Dyrt, I get products to test from time to time. On this trip I tested some bars and a backpacking meal from Wild Zora. Wild Zora is a line of paleo bars (meats and veggies) and dehydrated meals - see their website FAQ here for more info on the company and their products! I had a variety pack of their meat and veggie bars as well as some paleo meals to try out. I have been snacking on the bars during hikes, as well as after a run and for a quick snack during busy times at work when I don't have time to get a full meal. The consistency of the bars is great - just chewy enough, and very satisfying. The flavors are interesting combinations and I haven't had any that I didn't like (parmesan beef was probably my least favorite, I really enjoyed all the others). We also tried out the Palisade Pineapple Mango meal to go for breakfast. The meals and bars have a good amount of calories in them - perfect for fueling before/during/after hiking, biking, etc. while camping. They also pack and travel well - stuff into a pack easily while hiking, but can also be thrown into a carry on for plane travel, etc - just add some water or open your bar and you have a healthy alternative during a long flight to your adventure destination. My husband and I shared the Pineapple Mango meal as a snack with our coffee - it was tasty and filling. I liked the nutty taste and there was a lot of fruit in it (we had the older version, slightly bigger pouch with more calories). If I was fueling for backpacking or a long run/hike/bike the whole pouch would be perfect, over 600 calories in the older version, and 520 in the new pouches. I would highly recommend Wild Zora as a fueling option for an active camping adventure. Interesting flavors and quality foods that are paleo friendly. My only improvement would be to see a couple of vegetarian meals to go incorporated into the lineup. I eat vegetarian most of the time and my husband is a vegetarian, so there weren't a whole lot of options to share with him that I could choose. We stopped at Pine Grove Furnace State Park for a little camping break on a drive to Virginia for a family vacation. What a great spot! We got the last available campsite for the night we stayed - I booked ahead of time by calling the campground office and they were very nice and helpful. We stayed in site 29. It was nice and level with a large parking pad that could accommodate a camper or trailer. There's also a level tent pad if you are tenting, it, and a picnic table and fire pit. We were right at the intersection near the campground entrance and one of the other loops, but it wasn't noisy at all. The drinking water was right next to our site, which was handy. Bathrooms were close by and were fairly clean, and showers were free. There was firewood for sale at the host site, and the camp host was very friendly. The park has two lakes for swimming, with a rail trail that separates them, so they are easily bikeable. There are some great trails for running/hiking - the park is the halfway point on the Appalachian Trail! We did a very nice run from our campsite out to the scenic viewpoint on top of Pole Steeple (about 7ish miles). The lake is great to jump in and cool off after a summer run. The park is also just north of the expansive Michaux State Forest, which has miles of trails for ATVs, biking, hiking/running. The Park also has an old iron furnace (hence the name) with historical information about it. There is an Appalachian trail museum, which was very neat to check out, and the old Ironmaster's Mansion serves as a hostel and event venue. There is a well stocked camp/park store at the entrance. Cell service is pretty much nonexistent in the campground, so keep this in mind if you can't be out of touch (we had Verizon). We loved our stay here, and would definitely go back. As a Ranger for The Dyrt, I get to test products. At this campground, I tested the RoM Pack by RoM Outdoors. This is a pack that unfolds completely to serve as a blanket, and can also be used as an emergency poncho in inclement weather. It seems like it would be difficult to unfold and then re-fold back into the pack, but it is actually very easy. I did it once with the instructions, and then was able to do it multiple times after that without them. The instructions were easy to follow. there is a drawstring bag that comes with the pack, and the two outer pouches are removable as well, so you have a place to put your stuff if you're unfolding the pack. The sizing - I have a small build, and with the straps tightened all the way it was still very big/loose on me. The material is pretty heavy, so even empty it sagged down some. With anything of substance in the pack it wasn't very comfortable because it pulled away from my back. When opened as a blanket, the plastic buckles are underneath the material. You have to be careful about what kind of surface you are putting it down on, and I wouldn't walk on it, etc - these definitely have the potential to break. These packs are a very interesting concept, and I can see a variety of uses, particularly for people who may be out in the woods in one place for an extended period of time and don't need to carry a lot of gear in the bag (hunters come to mind for sure). I don't think this would be comfortable to do any real hiking with, but would make a great picnic bag or bag for festivals or sporting events where you can take your stuff out of it and spread out for the day. We stayed at Hendy Woods for one night in early October. What a beautiful campground! Nestled under a redwood forest with great running/hiking trails in the park. Very close to multiple wineries (we visited 3) as well as Anderson Valley Brewing Company (fun local craft brewery, beer was good and a fun outdoor seating area. Campground was clean, not busy at the time we were there so plenty of privacy and peace and quiet. Bathrooms were clean, water close to our site, and there were showers available which was nice. We did a trail run on the trails right in the park and it was so much fun! So cool to run around all of those big trees. Found the tree home of the "Hendy Hermit", a man who had lived inside a tree "fort" in the hendy woods many years ago and was somewhat of a local legend. Highly recommend this campground. This was a perfect stop as we headed down the coast from Mendocino. The drive there is beautiful, past a whole bunch of wineries. We stayed one night here in early October, after exploring the Mendocino area on a campervan road trip. Campsite was quiet and secluded, lots of trees so was pretty quiet and private. Clean bathrooms, drinking water was right next to our site. There were hiking trails right nearby, but sadly we arrived fairly late and were leaving the next morning so we didn't get to do much exploring. Area was pretty damp so a little chilly because of that. there were giant yellow banana slugs all over, which was pretty neat to see. Site had a picnic table and fire ring. Lots of open sites when we arrived (mid week in early Fall), no reservation needed. Convenient to explore Mendocino/Fort Bragg area, we took a walk around Mendocino and visited the glass beach. I would like to go back and explore the hiking there! We really enjoyed June Lake Campground! Stayed there for one night on our way out of Yosemite. The drive around the lake is beautiful and there are multiple camping areas. We stayed on a weeknight in October, so had no trouble getting an open spot without needing a reservation. The fall foliage was very pretty. Campsite was nice, large and level and tucked into the trees, so felt private and secluded. Some spots were right adjacent to the water as well. No showers, bathrooms with flush toilets. Drinking water and wash station were available. Short walk into town with a couple of restaurants and shops. We had some beers at June Lake Brewing company which was just a short walk away -highly recommend stopping in there. Dog friendly, very nice place with good beer! I would definitely stay at June Lake again. We stayed one night here in early October after spending 4 nights camping right in Yosemite Valley. This campground is about 40 minutes from the valley and at a higher elevation (6200 feet). It was fairly quiet and wooded (some sites were more private than others). Toilets were clean, drinking water easily accessible. Our site was pretty big, but the parking area wasn't super level (we were in a campervan). This was a very convenient site for a stopover on our way out of Yosemite, we explored the Valley some more before settling in here for the night, and then in the morning headed out Tioga Road with a stop at the Tuolumne sequioia grove. Sites have bear boxes (use them to secure all of your food!! ), fire rings (it was very chilly, we made good use of this at night and again in the morning over breakfast), and picnic tables. Crane Flat doesn't have the dramatic scenery of Yosemite Valley, and no hiking directly from the camping area, but it was a nice spot to camp for the night. Not a bad place to stay if you are exploring different areas of Yosemite, it is easy to drive out toward Tuolumne Meadows or head south to other areas of the park. Site was $26 for the night. We stayed here for a night after hiking Half Dome (stayed the previous 3 nights at Lower Pines and were lucky enough to get a spot here for a 4th night after our hike). Busy campground - don't expect privacy and solitude. Stay here for the location and use it as a base camp to explore the Valley; it doesn't get any easier to get around and still have a camping experience! No showers, showers are available at nearby Half Dome Village. Convenient access to water. Bathrooms were clean. Sites were decent size and had fire pits and bear boxes for food (be sure to use them!). Open sites, little to no privacy, you will see and hear your neighbors. Expect and embrace that. Easy access to trailheads for hiking and exploring. Rent or bring your bike if you are able - that is by far the best way to get around Yosemite Valley. I would stay here again, simply for the convenience of not having to drive/shuttle in to the Valley to hike, etc. Prospector is one my favorite camping experiences I have ever had! We were headed from Moab to Denver and had a few camping areas on our radar. We chose this at random and were lucky enough to get a site for a Friday and Saturday night overlooking the reservoir. Some wildflowers were blooming and the views of the mountains and water were out of this world! We were in site 54; the site across from us (53) is the best site in the whole place; very large site up above the water with unobstructed views. Sites 51, 53, 55, and 58 are all set up above the water and were really nice sites. All of the sites were pretty large and spread out so they weren't on top of each other. A beetle infestation had led to deforesting of the area apparently, so there weren't many mature trees. The upside was being able to take advantage of the views. Sites had a picnic table and fire pit. Vault toilets, no showers. Potable water spouts were spread around (our site happened to be right next to one, which was convenient). The sites in our loop were set high above the water, with a trail that led down to and along the reservoir. Firewood available for purchase there, and the camp hosts were very nice! It is a bear area, so be sure to secure food. We were told some moose were around down by the water as well, but we didn't see any wildlife. We went into Frisco (what a great town!! - if you like craft beer don't miss Outer Range Brewing co), and hiked in Breckenridge (Mohawk Lakes Trail), stopped in to walk around Breckenridge and had beers there after our hike. Prospector sits at 9,000 feet elevation, so be prepared for that! Nights and mornings were chilly but not bad (mid June). We LOVED Dead Horse Point State Park. Reserved a site here for two nights to explore the park itself, as well as nearby Moab. We were lucky to get a reservation!! The sites were fairly private given the lack of trees, etc. Each site had a covered picnic table area and a pantry that locked shut. We made the mistake of leaving a styrofoam cooler out when we went hiking - the Ravens pecked it to shreds!!! Warning - don't leave ANYTHING out. We didn't see the signs warning of this until afterward, oops! The sites have a level tent pad area, as well as a fire pit. Access to the rim trail around the canyon is right off the campground and is well worth the hike - beautiful views!! Bathrooms were clean and there was a dishwashing sink station at it as well which was handy. Each campsite had an electrical hookup. Seemed a mix of some RV's, campervans, and tents. Very quiet at night. The sunset was spectacular, and the night sky there was the most beautiful I have ever seen!! The dark desert skies and elevation on a clear night was just amazing. We sat out for hours around our campfire stargazing. Canyonlands is very close, and Moab/Arches is a pretty short drive. We were on a tight timeframe, so we only had time to explore Dead Horse Point itself after arriving from Bryce Canyon, and Moab/Arches the next day. I definitely want to come back out to explore Canyonlands, and will probably include a stop back at this park/campground! We stayed at Watchman Campground for 2 nights in early June at the beginning of a campervan road trip, sites C022 and C004. The campground was spotless and beautiful, flanked by rock formations. Our loop was tent sites. Both sites were large with nice level parking pads and level areas for pitching a tent if you are tenting it. Fire pits and picnic tables at each site. The views were stunning, especially at sunset. Campground was very open with a lot of sites (typical of most National Park campground from what I've found). Not a lot of privacy but campground was pretty quiet. Quick walk to the visitor's center to get the shuttle into the park, and walking distance to Zion Brewery as well! Sites were $20 per night and fill up quickly, we reserved ahead of time. Bathrooms were clean, water access was convenient. Not the campground to choose if you want solitude and to get away from it all - but if you want a fun camping experience with easy park access, Watchman is perfect!! We drove out and day hiked the Subway on our first day, and on the second day took the shuttle out to hike Angel's Landing and the Narrows. 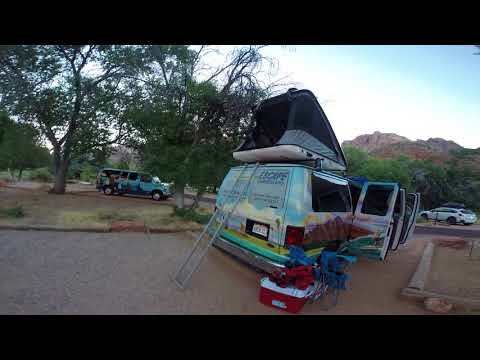 We stayed two nights at site #4 at Lost Dutchman State Park in early May, in a campervan. The campground is very large with multiple different loops, some with large open RV sites and some more secluded, a mix of pull through and back in sites. We walked most of the campground, and if you don't need a large RV or trailer site I highly recommend the sites from 1-15, they had pretty good privacy for a desert campground. The campground loop we were in was fairly empty when we were there (mid week). The view was amazing! Site was large and level if you are tenting it, with a nice level parking pad. Bathrooms were a bit of a walk from our area, so take that into consideration. They were spotless and the showers were available at no extra cost, which was great! Site was wonderful for just lounging around and relaxing at. Potable water spout was just two sites over, a short walk. There were fire restrictions so propane stoves only, no campfires. We hiked the siphon draw trail up to the top of the flatiron, a very challenging and unique hike with a lot of rock scrambling. The trail leaves right from the campground which was perfect. The campground was very clean and quiet while we were there. I highly recommend Lost Dutchman to anyone looking for camping near Phoenix! We reserved ahead of time, campsites were $25 with the online fee. The VIEW is the reason to stay here! The View Campground is located in Monument Valley on the Navajo Tribal land. There is an additional $5 fee to enter the tribal area, in addition to the camping fee. The campground area consists of RV sites (basically a series of parking spots parallel to each other with a picnic table), and the tent sites are hike-in only from the parking area. We stayed one night in a campervan in an RV site. I reserved the site ahead of time, and on arrival we were given a map with the occupied sites marked off, and we were able to choose our own site from the remaining sites. It's not called "the View" for nothing! Our site had a phenomenal view of the Mittens, and sunrise and sunset were stunning. While there we drove the 17 mile scenic drive around the monuments, and in the morning ran the 4 mile Wildcat trail. What a unique place to stay. It was VERY windy when we were there, but we were able to position our van so that cooking, etc. wasn't an issue. There are cabins adjacent to the camping area, and a hotel and store on the way in (we didn't stop at this). The staff were very friendly. Bathrooms were very clean and showers were available at no extra cost, which was great! (we were given an access code to the bathrooms on check in). No fires were allowed. The site is pretty pricey as it is essentially a bare parking spot; but this is the most beautiful parking spot I have ever slept in ;). Potable water was available at the far end of the campground. A one night stay was perfect for us to experience the area. The camp sites are not great for just hanging around at, but there are other tours (jeep, horseback) that you could take advantage of. Camp site was about $40. A credit card was required for the camp site. The park entry fee was cash only. Sites ~17 - 24 (or 25, can't remember) had the most unobstructed view.